For the last year or so, my Lowry ancestry research has ended with my 3rd great grandfather Michael Lowry. From what I can determine, Michael was born in Ireland in 1830, arrived in the United States in 1849 and died in 1921. Every fact has a source except his date of death. That is, perhaps, until last week. I was continuing my research and discovered a death certificate for a Michael Lowry of Salem, Ohio dated 21 Jun 1928. An 8-year difference in date of death is a researcher’s nightmare. Is this the same Michael Lowry? Is this a random cousin or someone who is not related? I have to admit, with his original date of death uncited, I’m not even sure how I came across the year 1921 (probably an Ancestry.com Member Tree). Well, I continue to search for a 1921 death and now the new 1928 death. The great thing about this death certificate is that it adds the name of a father (Thomas), mother (Mary) and address to use as research points. I’m looking for more to back this document up and will let you know what I find. Update: (14 Apr 2014) This is the death certificate of my third great grandfather Michael Lowry. I’ve featured him quite a bit on the blog so do a quick search (above) for the follow-up. 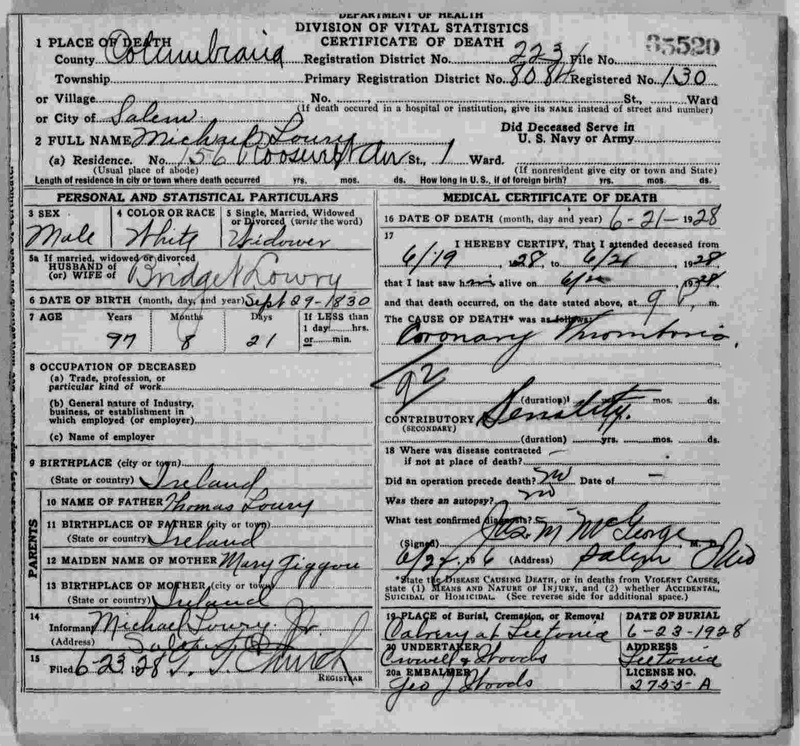 “Ohio, Deaths, 1908-1953,” index and images, FamilySearch (https://familysearch.org/pal:/MM9.1.1/XZJB-6JH : accessed 01 Nov 2012), Michael Lowry, 1928; citing reference fn 35520, Ohio Historical Society, Columbus, Ohio. If this is your Michael, you've got a great lead into the next generation. Perhaps you can confirm this is your ancestor by knowing the 'informant' for the death cert. Thanks! I'm about 90% certain this is the right guy but I don't want to start adding family members without another source. Also, you have a great blog! I've bookmarked it and will definitely make repeat visits. I see you live in Fairfax; I'm in Loudoun. Hi neighbor!